Aluminium bi folding doors and windows installed by DWL into this property in Kent. Aluminium bi folding doors seem to be involved in every project we are involved in lately. 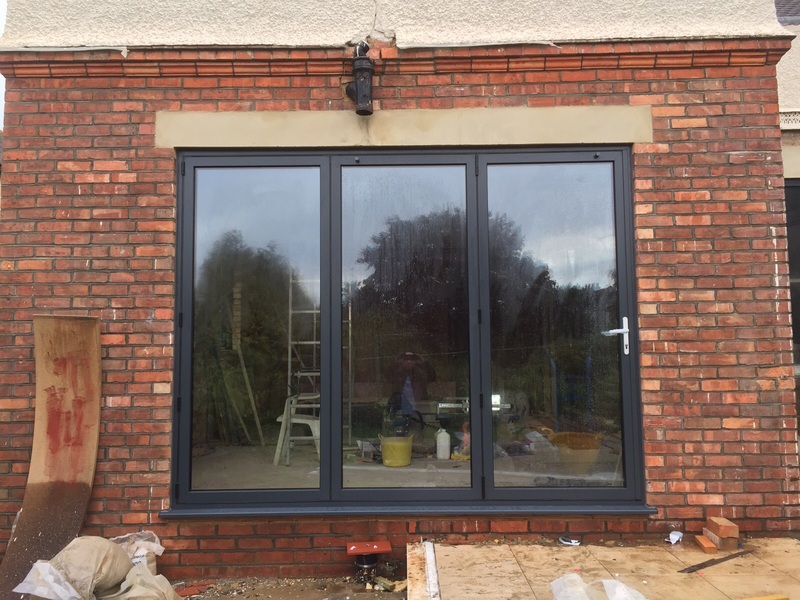 This project nicely shows off our slim frame aluminium windows alongside our bifolds in a 3 pane configuration as well as our bifolding doors being used as double doors. These customers arrived with us coming through from Smart Systems, for whom we install many windows and doors all over the South East. From the off, James worked closely alongside the customer with an initial site visit followed by a showroom appointment to iron out the finer details and be sure on the product before making any decisions. The brief was to maximise glass sizes, this creating more light and a modern clean look at the same time. Aluminium was the obvious choice for this (if you look at the photos below, it’s not hard to see why!) The 3 pane aluminium bifolding doors was a no-brainer, the customers wanted 3 panes all going the same way with a traffic door at one end for easy access in and out. When it came to the two pane doors, we suggested an alternative to standard double doors. As the doors were near each other and as you can see in one of the photos below, the 3 pane doors and the 2 pane doors can be seen together quite easily. So, for a marginal extra cost, we put forward the idea of making the double doors from bifold material, which is a thinner profile than standard double door profile, but would also give the door sets more consistency throughout the property. Based on the photos, we think we were right! The final spec was our ever-popular RAL 7016 Anthracite Grey matt with satin chrome handles. The glazing was our Planitherm Total Plus double glazed units with toughened glass. Please see the before and after photos below to get a better grip on the project.